One of the most popular classes at 20th Street Elementary School has 43 dedicated students who come twice a week. The parents of this 600-student school just south of downtown Los Angeles come here to learn English. They do projects for teachers. They discuss school issues. Their children even help them with their English homework. And it’s all taking place at one of the most active rooms on campus: the parent center. LA Unified officials, board member Monica Garcia and about 50 parents gathered Tuesday to dedicate the new parent center with a ribbon-cutting ceremony and student performances. The ceremony also marked a healing of sorts among divided parents who had twice moved to use a “parent trigger,” a California law that allows parents to take over a failing school. District officials and the school board have come to realize that encouraging more parent centers on school campuses leads to more community engagement, higher attendance and eventually better test scores and higher graduation rates. Nearly half of the school sites — more than 500 — at the nation’s second-largest school district have at least one classroom dedicated specifically as a parent center. Many of them have computers, Internet, desks, materials, copy machines and other supports for parents to use during and after school and sometimes on weekends. This year alone, 70 parent centers opened at district schools and 40 more will open before the end of December, said Rowena Lagrosa, senior executive director of parent, community and student services. The district has a request before the school board for 155 more centers. 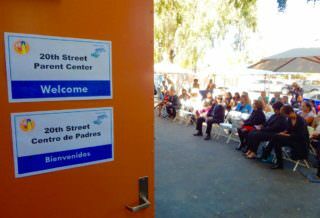 The 20th Street parent center. The costs per school for a new parent center run from $65,000 to $100,000, according to Lagrosa, who added, “Some of our schools need a little more TLC.” The district provides a cart with 20 Chromebooks, like those already provided to schools for testing. The school’s principal, Mario Garcielita, welcomed the parent center and acknowledged the difficult period with different factions of parents. For the past year, parents met at nearby homes to figure out how to force improvements at the school. Now they can meet on campus to voice their issues and talk among themselves. In June, the parents, teachers and the district agreed to move 20th Street into the Partnership for Los Angeles Schools, which now operates 19 schools in South LA, Boyle Heights and Watts. With Partnership, the school remains under district control but is granted more educational autonomy. It also benefits from the nonprofit organization’s many community connections and resources. Partnership CEO Joan Sullivan attended Tuesday’s dedication and pointed out the importance of parent centers. Although the parent center was in the planning stages before Partnership came on the scene, Sullivan said they have helped with equipment and supplies for the center. Board member Garcia chatted in Spanish with parents and children after the second-graders recited the poem “I, Too, Sing America” and sang “This Little Light of Mine.” Then the school drill team performed. As parent Vilchis pointed out, parent involvement could be as simple as helping a teacher cut out shapes or sweep the classrooms.